God Force: Lu Bu's primary weapon. It was masterpiece as a weapon due to its versatility that put to use all major characteristics of large two handed weapons, allowing it to be efficient in slashing, thrusting, battering, scything, and sweeping. 1. The Sword: Designed for heavy damage able to break enemies defenses. Lu Bu Gains a Rank in strength if God Force is hindered by a block, or enemy defenses. The Buff only counts for the slash. 2. The Halberd: Designed to impale whole rows of enemies. When Thrust forward a beam of energy extends from the tip of the spear for five meters. This beam does damage as if it were the spear itself. 3. The Bracers: God force can transform into a pair of Combat Bracers, which can be used offensively and defensively. When on the attack Lu Bu gains an additional Rank in speed. When on the defense he gains a Ranking in health. 4: The Scythe: Designed for sweeping aside whole ranks of enemies. A blade of energy like that on a Great Ax is produced from the side of God Force, when it's used in this mode. When used to swipe enemies aside this energy does it's own damage to weaken a foe before god force itself finishes them off. 5: The Shield: When in this mode God Force can Absorbs Attacks Who's Rank is Less Than God Force's Rank. 6. Cannon: The Bow form of God Force. Able to send arrows 100 Meters away with dead point accuracy. Arrows shot while in this mode Gain an additional rank in speed and ignore one point of armor. First Among Men, Lu Bu. First Among Horses, Red Hare. 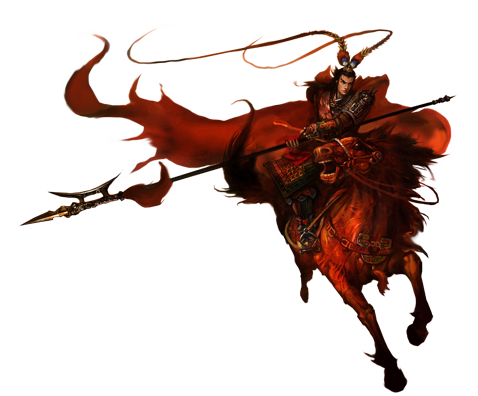 Red Hare was Lu Bu's Gargantuan Ash Red Warhorse. Said to be able cross a thousand leagues in a single day, and trample through rivers, and mountains as if they were flat lands. Red Hare is a horse with stats equal to those of the Saber Class, only his speed is at the EX Rank. Lu Bu's Strength is always one rank higher than the class he's in. 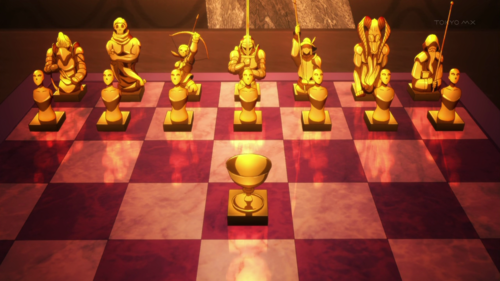 Lu Bu always ends up betraying his master, unless they are clever enough to avoid it.